Watch all the weekend’s best pro gaming until your eyes bleed. It’s a stacked weekend, beginning with the The Call of Duty World League Anaheim Open, a $200,000 tournament with big consequences for the 2017 Championship later this year. Cloud9, Red Reserve, BitterSweet and Fnatic won spots in the Global Pro League as well as Championship invites for their performance in the Relegation Qualifier held earlier this week. Today, the action resumes at 1:00PM EDT (and the same time on Sunday) as players push through the group stage into the double-elimination bracket. DreamHack 2017 is finally here, with a number of pro gaming tournaments headlined by CS:GO whose group stage is currently underway. Matches are ongoing throughout the day, with Group A featuring SK Gaming, Mousesports, Immortals, and Team Singularity while Group B pits Counter Logic Gaming against Fnatic, Cloud9 and Gambit Esports. SK Gaming will play again at 1:00PM EDT today while CLG plays again at 2:30PM. The final group matches will take play on Sunday starting at 5:00AM EDT. You can watch all of them here. The PGL Europe Minor Championship also wraps up this weekend. 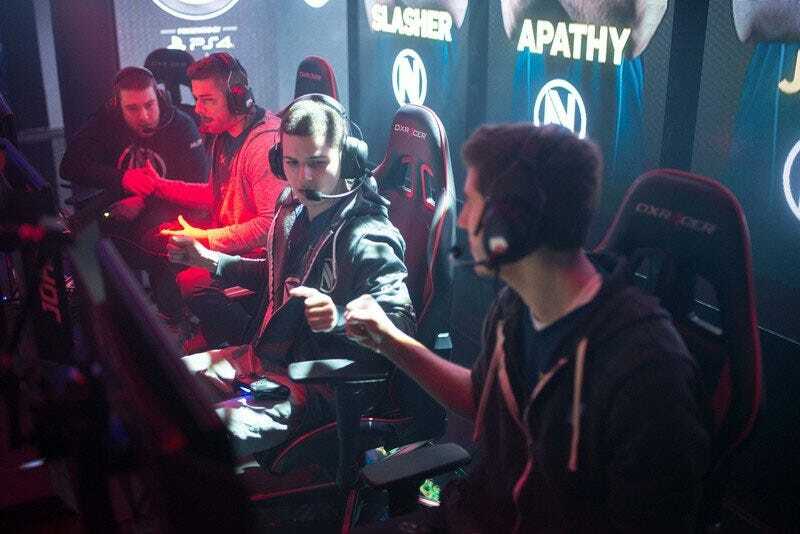 BIG and Team EnVyUs play at 3:00AM EDT Sunday, with the grand finals scheduled for 11:00AM later in the morning. You can find that tournament streaming live here. The Summit 7 LAN finals are here after several rounds of qualifying and Team Secret have already earned a spot in the grand finals. Meanwhile, LGD await their opponents in the loser’s finals as Natus Vincere, Team NP, Virtus Pro, and Digital Chaos try to stay alive. Na`Vi face Team NP today at 1:00PM EDT, followed by VP vs. DC at 4:00PM EDT. The grand finals are scheduled for 4:00PM EDT on Sunday. Week three of the LCS summer season concludes this week beginning in Europe with Ninjas in Pyjamas vs. ROCCAT at 11:00AM EDT and H2K vs. Team Vitality at 2:00PM. Than stateside it’s Team Liquid kicking things off at 3:00PM EDT against Team Solo Mid until Phoenix1 finish things up at 6:00PM EDT against Team Dignitas. On Sunday, TSM will try to work its way up the table with a victory over Team EnVy at 3:00PM EDT while Echo Fox and Dignitas close things out at 6:00PM. Overnight, LGD plays OMG in China’s LPL at 2:00AM EDT, followed by RNG vs. NB and JDG vs. SNG at 8:00AM, while in South Korea SKT will be looking to pick up a win against AFS at 4:00AM EDT followed by Samsung Galaxy vs. EEW at 7:00AM. Hearthstone’s Summer Grand Prix is currently going on at DreamHack as well, with play going on today and Sunday untill 2:30PM EDT, with the grand finals scheduled for around the same time on Monday. As will be the case for a lot of games this weekend, Street Fighter V talent is currently split between DreamHack and CEO 2017. PG Punk and Liquid’s NuckleDu headline the latter with matches going on all day until about 8:00PM EDT tonight, with top 8 play scheduled for 7:00PM EDT on Sunday. That tournament will be streaming below. In Europe, pools go until 1:00PM EDT today, with playoffs beginning Sunday morning at 7:00AM. That tournament (when top 8 begins) will be available in the feed above. 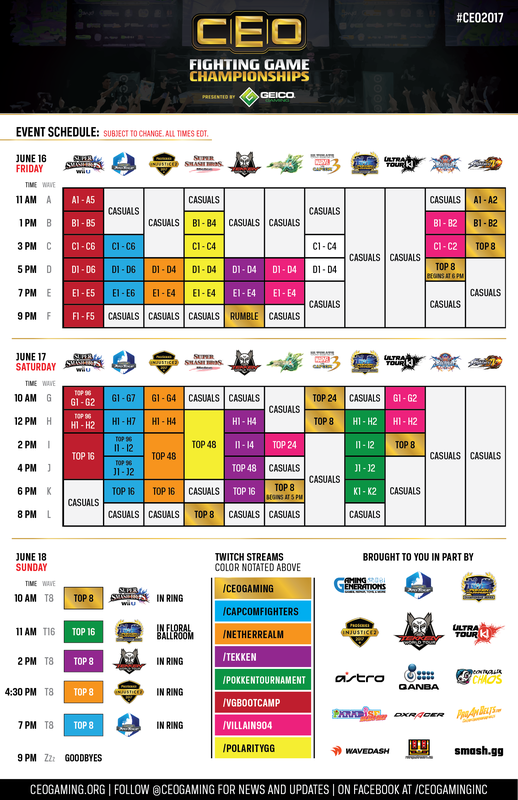 On the CEO side of things, Smash Bros. Wii U will see top 16 start at 2:00PM EDT today, followed by top 8 on Sunday at 10:00AM, while for Melee all of the action starts and stops in the next twelve hours with top 8 slated to begin at 8:00PM tonight. Those tournaments will be streaming here and here. For DreamHack, the $10,000 prize pool action will conclude early Sunday morning and be available to stream here. Bracket play for Heroes’ Mid-Season Brawl started earlier today, with MVP Black and Team Dignitas currently battling out for a sspot in the upper bracket finals against Fnatic. The action then picks back up early on Sunday with eStar Gaming vs. L5 in the lower bracket at 4:00AM EDT, and going until the grand finals scheduled for Monday at 2:00PM EDT. The StarCraft II World Championship Series will also be visiting Sweden for DreamHack 2017, with matches in the $100,000 tournament playing out each morning until the grand finals in the AM on Monday. The EU Overwatch Contenders Group Stage starts this weekend with matches beginning today at 10:00AM EDT including teams like Misfits, EUnited, Ninjas in Pyjamas, and Lazer Kittenz. The second leg of group stage matches will then take place next weekend, followed by the single-elimination bracket at the start of July. You can stream all of the matches here. Nintendo’s pocket monster fighter continues its unlikely rise as an esport with tournaments at both DreamHack and CEO. The former can be streamed here, while the latter will be playing out here, with playoffs scheduled to begin at 11:00AM EDT on Sunday morning. Tekken 7 will also have top 8 play at CEO beginning Sunday at 2:00PM EDT followed by Injustice 2 at 4:30PM, while Guilty Gear, Marvel vs. Capcom 3, and a slew of other games will conclude their tournaments all later today. You can find a complete schedule and list of Twitch streams to follow them on here. Last, but certainly not least, DreamHack is hosting a Rocket League tournament with group play expected to go through 3:00PM EDT today before picking back up Sunday morning. You can stream those matches here.